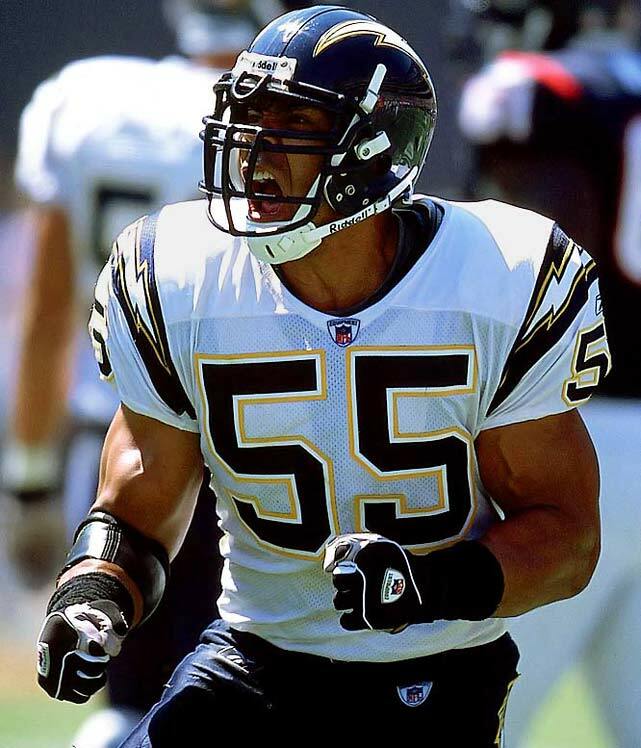 Today, NFL legend Junior Seau, was found dead by a suspected self-inflicted gunshot wound to the chest. In February, Bears great Dave Duerson killed himself in similar method. Duerson left a suicide note in which he asked his family to make sure his brain was donated to the NFL brain bank for research. Duerson's fears were realized when Boston University analyzed his brain and found that he had suffered from the same disease as more than 20 deceased former NFL players - Chronic Traumatic Encephalopathy. CTE, a disease that was previously only associated with boxers, is degenerative and incurable and is caused by repeated concussions or lesser blows to the head. The effects of CTE can begin months, years or even decades after the last brain trauma. Symptoms of CTE can include impulse control, aggression, depression, memory loss, confusion, impaired judgement and eventually, progressive dementia. Seau's death was reported on the same afternoon as the NFL Commissioner's punishments were handed down for the the remaining players involved in the Saint's "bountygate." 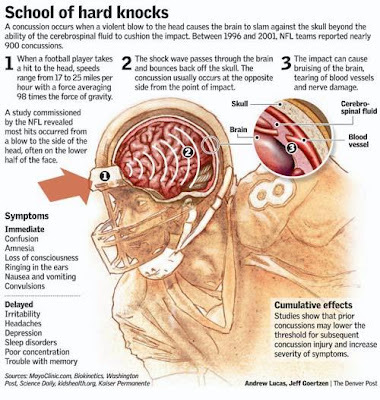 While it is too early to tell if Seau was suffering from CTE, it is clear that we are now starting to see the effects of repeated concussions or hits on NFL players. 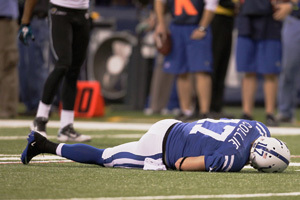 From the Colts' Austin Collie that got hit so hard he looked like a Rockem Sockem Robot, to Colt McCoy getting flattened by James Harrison, guys are getting hits that may later destroy their lives. Football is by nature, a brutal sport. The athletes were helmets and protective gear for a reason. The concept of the game won't change, but the players, coaches and trainers need to acknowledge the dangers involved. When a player is injured, as a competitor, they want to get back into the game at any cost. Stars of the game such as Brian Urlacher and Peyton Manning have admitted lying to trainers to stay in the game or tanking their concussion baseline tests. Players, like the case of Colt McCoy, may not even realize they are injured until the next morning when they can't remember the previous night's game. That is when trainers and coaches *must* step in and make the call for the player, and pull them out of the game if necessary. One new piece of technology being tested is called the Intelligent Mouth Guard. The mouth guard measures hits that the athlete has endured, sending the data back to the sidelines. Once a threshold is met, the player gets pulled. Period. As more tests and new technologies are discovered, they must be embraced by the teams...and the fans. When Will Indians Fans Show Up? If You Catch A Ball - Keep It Or Give To A Kid?